AAPL is up +7.61% for the week, down -2.78% for the month, up +20.45% for the year, and up an amazing +205.40% since the March 9, 2009 market bottom. This equates to +$17.96 for the week, -$7.27 for the month, +$43.09 for the year, and an incredible +$170.71 since the March 9, 2009 market bottom! Apple's market capitalization at $230.96B is now third largest in USA, behind Exxon and Microsoft. AAPL is approximately $22.58B below Microsoft's market cap of approximately $253.54B. The intermediate-term signal, the comparison of the 25 day and 50 day simple moving averages, generated a buy/long/bull signal on Friday, March 12, 2009. Therefore, AAPL is now in an intermediate-term bull market and has remained so during the recent pullback and related Flash Crash. That is, the 25d sma is higher than the 50d sma. The current closing price, the higher yellow horizontal line is below the 2010 YTD and all time closing high of 270.83 on April 23. AAPL is also below the final run up to those highs in late April. So the only resistance above is recent. The most recent support is just below at the April 15 peak closing price of 248.92 and in that general time and price area. There are multiple levels of support below this. The ongoing EU and Euro Crisis pulled down high beta technology sector stocks today, Friday, May 14. and AAPL closed below the 25 day simple moving average. Even during this recent pullback and Flash Crash, AAPL closed only on Friday, May 7 below the 50 day simple moving average. AAPL still remains above the 50d, 100d, and 200d sma's, which are all ascending. The yellow uptrend line, a rate of price ascent, is from the January 20, 2009 closing low of 78.20 up through the February 4, 2010 closing low of 192.05. The February 4 closing low has been the bottom for 2010. AAPL spiked decisively above this uptrend line on February 25. AAPL has now stayed well above henceforth. The downtrend line, a rate of price descent, is from the April 23, 2010 YTD and all time high of 270.83 down through the April 29, 2010 peak of 268.64. 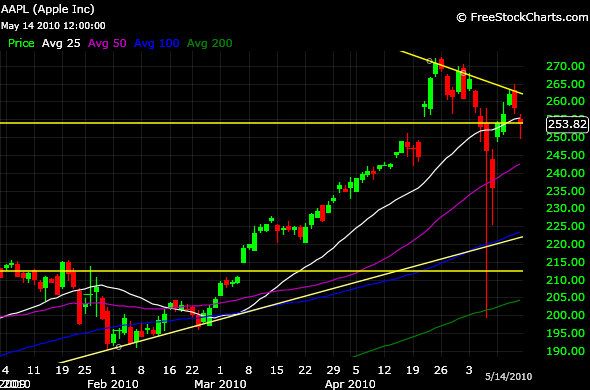 AAPL has stayed below this downtrend line. The RSIs are signalling plenty of upside room. The MACD has been bearish since May 4 as the pullback, Flash Crash, and EU & Euro Crisis pulled the related ema's down. The MACD has been uptrending. Through the recent pullback, Flash Crash, and EU & Euro Crisis, the fundamentals at Apple Inc. never changed. Apple Inc. is doing great! Apple has been charging ahead with the introduction of the iPad, iPad 3G, a new iPhone OS 4, a new mobile advertising platform (iAd), a new iPhone 4G to be launched in June, overall strong iPhone sales and market share, and now reports of very strong iPad demand. The current price is low based on AAPL fundamentals. The RSI 14 day and 28 day are leaning oversold to reasonable. The MACD is bearish but is uptrending. The intermediate-term trend became bullish on Friday, March 12 and remains so. The long-term trend remains bullish. Over 1 million iPads have now been sold. Apple has begun taking international preorders and will launch in 9 countries on May 28. Apple launched the iPad, the Big Day, on Saturday, April 3. Reviews of the iPad have been favorable overall. The App Store keeps adding iPad apps and the iBook store the same. Estimated 2010 sales of iPad range from 3 million units to 10 million units. It has been suggested that iPad sales might cut into iPhone sales some, but I don't believe this will have a material effect. So far, no one has come out with a "second tablet" to compete with the iPad, although there are constant rumors a competitor is coming. The iPhone OS 4 was announced on Thursday, April 8 by CEO Steve Jobs . iPhone continues incredible sales and market share. The Q1 results for iPhone were outstanding and pump the profits into Apple Inc. Apple's share of global mobile Web browsing is at 67% from the iPhone and iPod Touch. Q1 earnings were released on April 20 and AAPL beat on revenues, EPS, and outlook. Numerous analysts raised price targets to $300+ within 48 hours. Q2 will include iPad sales and should be another stellar quarter.